Landell Mills recently organised an awards ceremony in Abuja on behalf on the EUD to Nigeria and ECOWAS and the UN Women Country Office in Nigeria. The ‘Picture It’ competition called for art students based in Nigeria, aged 18-28 years, to express what came to mind when they reflected on women’s rights and gender equality, and the positive changes they would like to see. Over 100 designs were submitted from across the country. Five winners were selected by a jury comprising professional comic artists and gender equality experts. The winning cartoon comics highlighted issues related to gender stereotypes and traditional roles of men and women in the Nigerian society, as well as the need for political inclusion and the education of young girls. 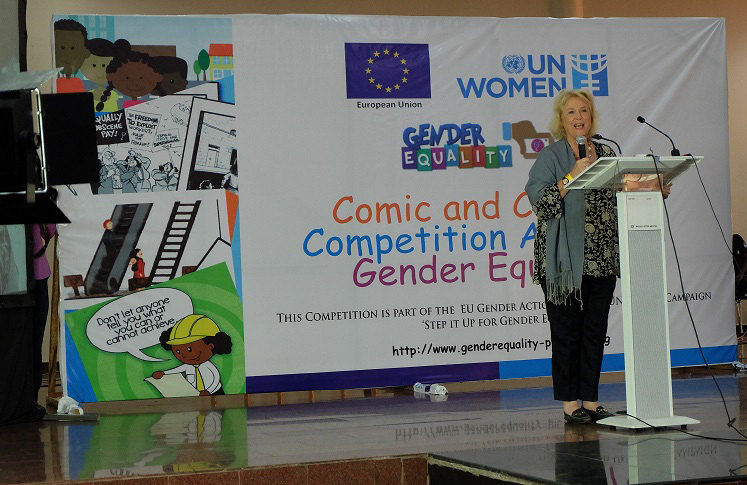 The comic competition forms part of the EU Gender Action Plan and the UN Women Campaign ‘Step It Up for Gender Equality’. Ketil Karlsen, the Head of the EU Delegation to Nigeria and ECOWAS, said, "Girls and women’s rights should be respected and protected throughout the world, and involving the youth in the process is investing in a better future for all of us". Please click here to see all of the winning entries. For more information about Landell Mills’ communications project in Nigeria please click here.